We offer Custom Private Escorted photography tours in the west and southwest USA that are designed for amateur and professional film and digital photographers. Our tours are led by an experienced photographer guide. Our wildflower photo tours are available from most any Western USA seasonal location. 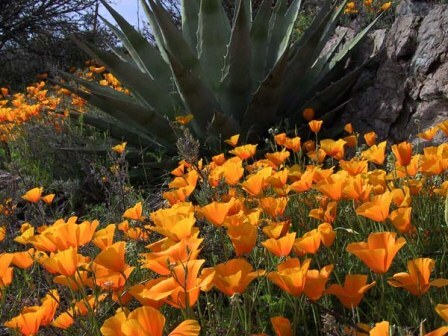 Wildflowers are in bloom throughout the year in many different parts of the West and Southwest. We plan tours that are custom designed to hit the peak bloom areas. We can customize itineraries to your specifications and personal desires. We can arrange for all accommodations, meals, access permits, and we will make all reservations as needed. Wildflowers bloom from the middle of winter through the fall, depending on the elevation, climate and recent weather conditions. Some of the flowers and cacti available in the areas of our Arizona, California, Nevada and Utah include brittlebush, Mexican poppies, scorpion weed, lupine, desert chicory, globemallow, chuparosa, firecracker penstemon, prickly poppies, pincushion, owl clover, blackfoot daisies, hedgehog, ocotillo, cholla, saguaro, fleabane daisies, desert chicory, indian paintbrush, and many more. We specialize in landscape and wildlife photography. The itinerary for these tours is built around "best lighting" options for specific locations at specific times. Optimal lighting is particularly important if a photographer hopes to get exceptional landscape photographs. Morning and evening light is usually preferred. Travel between sites will occur mid-day. The price quoted for our Custom Private Escorted tours usually covers your tour photography guide, transportation in a new model vehicle, cold drinks, snacks, access fees, park entry fees and accommodations. We also provide research materials, photography guides, travel guides, plant and wildlife guides, and a personal notebook with other resources and record keeping forms.